Palestinian teacher of the Law. His period is not known, but according to a conjecture (see "'Aruk," s.v. "Askolastika") he was the son of that Joshua b. Hananiah who in Gen. R. lxiv. 10 is called "Askolastikus." 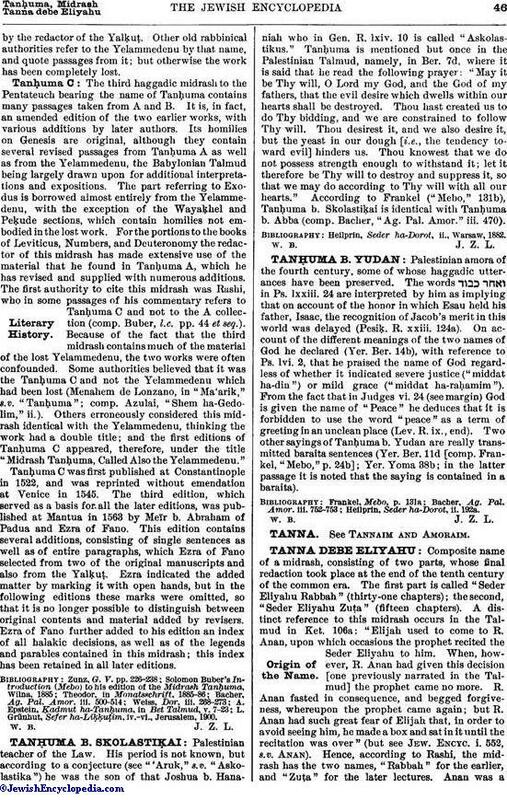 Tanḥuma is mentioned but once in the Palestinian Talmud, namely, in Ber. 7d, where it is said that he read the following prayer: "May it be Thy will, O Lord my God, and the God of my fathers, that the evil desire which dwells within our hearts shall be destroyed. Thou hast created us to do Thy bidding, and we are constrained to follow Thy will. Thou desirest it, and we also desire it, but the yeast in our dough [i.e., the tendency toward evil] hinders us. Thou knowest that we do not possess strength enough to withstand it; let it therefore be Thy will to destroy and suppress it, so that we may do according to Thy will with all our hearts." According to Frankel ("Mebo," 131b), Tanḥuma b. Skolastiḳai is identical with Tanḥuma b. Abba (comp. Bacher, "Ag. Pal. Amor." iii. 470). Heilprin, Seder ha-Dorot, ii., Warsaw, 1882. Palestinian amora of the fourth century, some of whose haggadic utterances have been preserved. The words in Ps. lxxiii. 24 are interpreted by him as implying that on account of the honor in which Esau held his father, Isaac, the recognition of Jacob's merit in this world was delayed (Pesiḳ. R. xxiii. 124a). On account of the different meanings of the two names of God he declared (Yer. Ber. 14b), with reference to Ps. lvi. 2, that he praised the name of God regardless of whether it indicated severe justice ("middat ha-din") or mild grace ("middat ha-raḥamim"). From the fact that in Judges vi. 24 (see margin) God is given the name of "Peace" he deduces that it is forbidden to use the word "peace" as a term of greeting in an unclean place (Lev. R. ix., end). Two other sayings of Tanḥuma b. Yudan are really transmitted baraita sentences (Yer. Ber. 11d [comp. Frankel, "Mebo," p. 24b]; Yer. Yoma 38b; in the latter passage it is noted that the saying is contained in a baraita). Heilprin, Seder ha-Dorot, ii. 192a.